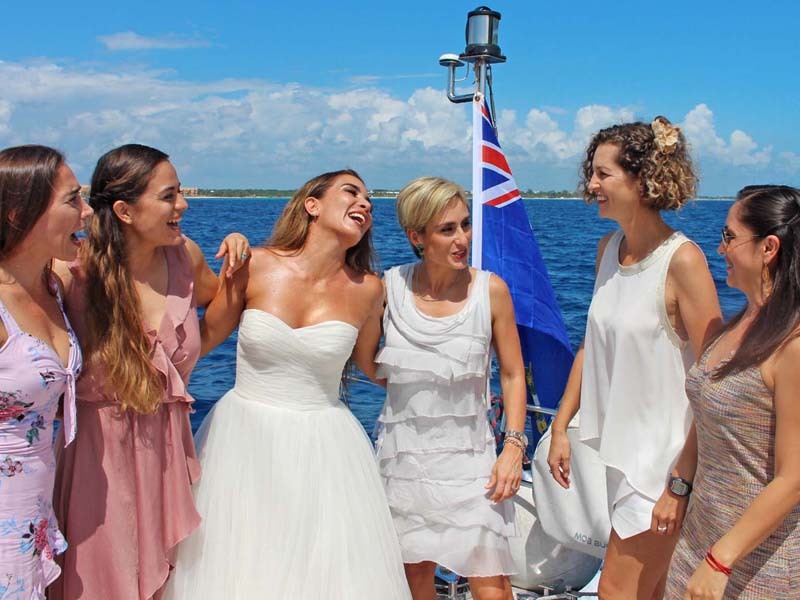 Mayan Riviera private catamaran charters for weddings, anniversaries, and other special occasions. At Paradise Catamarans, we believe that if we enjoy what we are doing then you'll have fun too. And what we most enjoy is making our guests happy. You only have to read a few of our customer testimonials to appreciate our commitment to our guests. If we have had the privilege of hosting you previously, you appreciate our commitment to our guests. We understand that our customers value the personalized attention they receive on our excursions. We remain a small operation dedicated to meeting the individual needs of our customers. Whether you are sailing, snorkeling, or swimming, there is never a shortage of guides on our tours and always an abundance of personalized attention. Because we specialize in weddings, family reunions, memorial services, corporate events, and other special occasions, we work hard to create memories to last a lifetime. The Mexican Caribbean is our home, and we'll treat you to an experience you won't find anywhere else. Our 46-foot and 75-foot catamarans have been customized for fun and comfort, with plenty of room to stretch out and easy access to the water. When you charter a tour with Paradise Catamarans, your guests become our guests. You concerns about the success of your outing become our concerns. Our snorkeling equipment reflects our attention to detail. We offer our guests semi-dry snorkels, which minimize the amount of water entering the breathing tube. We also make sure that our guests enter the water with a mask and fins that fit them well. In short, we've thought of just about everything so that you can get down to the business of enjoying your excursion. We'll see you on the Riviera Maya!